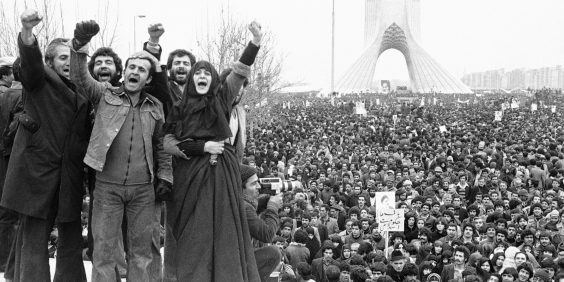 Demonstrators in Shahyad Square, Tehran, during the 1979 Revolution. Image via: Wikimedia Commons. They came and took him from the front of his house. His friends saw that he was arrested on the street. Yesterday he left home and there has been no news of him since. Over the past four decades, one could hear such words from many families — families who are still looking for their loved ones, families who still don’t know what exactly happened to their loved ones, families who are not sure if one day their children will return. This story and these questions are the story and questions of many families who have lost their loved ones over the past thirty-seven years. One family’s beloved was present at a protest and later disappeared; another family’s dear one belonged to a protest group and the news of her arrest had arrived, but later there was no news of her; a baby was born in prison, and after a few days of separation from her mother, she disappeared. In Iran, people have been missing for days, months, years, decades. It is a black list, a famous black list, that includes people from every event, group, and organization, from every religion, sect, and tradition, who share in the same pain like these suffering people throughout the years. The disappearance of people under authoritarian regimes or governments who do not care for the life and well-being of their citizens is not an issue that starts at one point and ends at another. The inventory gets longer as time goes by, but this dark night is not going to be over until there is an everlasting morning for all the people of this land. 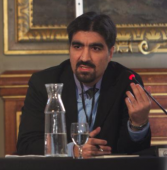 Ali Kalaei is an Iranian journalist, blogger, and activist who rose to prominence for his work criticizing the Iranian government for its human rights abuses. He is a member of the Committee of Human Rights Reporters (CHRR) and the Human Rights Activists News Agency, and has written regularly for publications that include RoozOnline, Mellimazhabi and Gooya News, and he has been an active member of the Peace Mark Magazine, an online human rights, social and legal magazine, since March of 2014. Ali Kalaei has been repeatedly targeted by Iranian security forces for his work, and in 2011, the Tehran Revolutionary Court sentenced him to six years in prison, in part for his writings about prisoners of the regime. 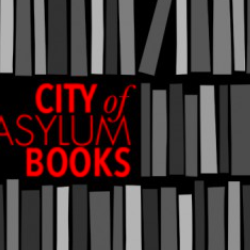 Ali Kalaei is the ICORN writer-in-residence of the Eskilstuna City of Refuge in Sweden. On August 21, 1980, eleven people — nine of whom were members of the National Spiritual Assembly of the Baha’is of Iran — were kidnapped during a session of the assembly. Abdol-Hossain Taslimi, Hooshang Mahmoodi, Ebrahim Rahmani, Dr. Hassan Naji, Manoochehr Ghaem Maghami, Ataollah Maghrebi, Yosuf Ghadimi, Behieh Naderi, and Dr. Kambiz Sadeghzadeh Milani were members of the first National Spiritual Assembly of the Baha’is of Iran. In addition, two Baha’is by the names of Dr. Yosuf Abassian and Dr. Heshmatollah Rohani, assistant continental consultants of this assembly, disappeared. And still, three decades later, there is no news of them. In another interview with London Kayhan, Kavian Sadeghzadeh Milani, the son of Dr. Kambiz Sadeghzadeh Milani and Shahin Sadeghzade Milani, referenced meetings of their family, especially the meeting between the wife of Dr. Kambiz Sadeghzadeh, Hashemi Rafsanjani, who was the head of the parliament at the time, Beheshti, the then-head of the judiciary system, and Ghodusi, the then-head prosecutor of the Islamic Republic. They said that of course no resolve was issued from these meetings and the situation of these disappeared Baha’is has not been cleared. Dr. Kavian Sadeghzadeh’s understanding could be accurate. The Islamic Republic also arrested the second National Spiritual Assembly of the Baha’is of Iran in November 1980, and after a group trial, (the video of which was published by Taslimi Foundation after three decades) executes them. The story of the kidnappings of various activists of different causes continues in the 1980s. People disappeared from group to group and no account was given to their families about them. Some families have been so lucky to know what happened to their loved ones by seeing their pictures among the executed in the newspaper. In this decade, even children are not safe from the thievery of the tornado of control. Children who are born in prison grow up and touch suppression with their own flesh and blood and skin. Children, who from a certain age, are not delivered to their mother from the ward, while the kings sitting on their throne and rulers of execution and torture tell these mothers: “You are not worthy of raising children.” But this is not the only story of these children born in prison. Some of these children find another destiny. They disappear. Golroo Rahemipour, the daughter of Hossain Rahemipour, was born at the beginning of the Persian New Year in 1984. They took her from her mother to do a medical checkup, even though she was not sick. And later they did not give Golroo’s mother an answer when she asked what had happened to her child. This disappearance is not specific to Golroo; security agents announced that Golroo’s father has been executed, but do not deliver his corpse to his family. These words from Lajevardi could raise these doubts in people’s minds that these children have been kidnapped by security agents and given to the agents’ families or to families that, according to the interpretation of the regime of Islamic Revolution, are members of Hezbollah and maybe could not have children. These children, in the words of Lajevardi, could become members of Hezbollah. But at the end of this decade and after the killings of 1988, the Islamic government took up another method to eliminate the opposition. Prisoners who go on leave, after getting in touch with “infected” messengers who are created by the regime and are in touch with their corresponding organization, fell into the trap of the regime’s security and again are afflicted; but this time, they disappear. One could find this example in fate and in the story of Siamak Toubai. Siamak Toubai, an 18-year-old senior at Kharazmi High School, who was arrested and charged with supporting Mujaheddin Khalgh. According to his sister, because of his father’s interference, he hadn’t even participated in the June 20, 1980 demonstration. Finally on September 5, 1980, he was identified by a friend who had become a member of Hezbollah, and was arrested. After his execution was announced twice in widely distributed publications in order to disturb his family, he was sentenced to 12 years in prison. Siamak Toubai was among those who became aware of the government’s intention for mass murder, and his life was spared from the killing of 1988. He and comrades who survived the mass murder of 1988, with awareness of this diplomacy, tried to save their own lives by reaching the other side of the borders of our country. They were a voice calling out the tyranny afflicted on thousands of activists and Iranian fighters. Siamak Toubai, after receiving leave from an agent, and initially escaping from the authorities, attended a meeting, and fell into a trap the authorities set up for him. Nazila Toubai, Siamak Toubai’s sister, told the interviewer that two letters arrived at that time in order to distract his family but with the wrong chronology. The first letter said that he had arrived at his destination, and the second letter announced that he was still in Pakistan and wants to presented himself to the authorities of the Islamic Republic at the Embassy. Nazila Toubai said that after her investigation it became clear that the addresses from which the letters from Pakistan came did not exist. According to Siamak’s sister, her investigations from the Mujaheddin Khalgh rendered no result on that front either, and they have not gotten an answer. The government responded to investigations by saying, “Siamak Toubai has disappeared and we are looking for him as well.” Nazila Toubai said that the government agents create a scene to suggest that Siamak has escaped. Finally, the news of the brother’s execution reached the sister and family and other friends from two sources. Mohammad Islami, another person who disappeared during those years after going from the prison of the joint committee to Evin Prison, told Iraj Mesdaghi, an author and supporter of Mujaheddin Khalgh, who was in captivity in those days, that he saw Siamak in the joint committee and gave the news of his execution to Mesdaghi. This is a fact that Mesdaghi has confirmed. According to Nazila Toubai, in the year 1996 or 1997, the publication of Mujaheddin Khalgh, a movement that advocates for the overthrow of the regime, also announced that Siamak Toubai, and others like him, had fallen into the trap of Iranian security forces and been executed. Siamak Toubai’s sister continues that Siamak Naderi, Siamak Toubai’s friend, confirmed all Iraj Mesdaghi said after leaving Camp Liberty in Baghdad after years of being imprisoned there. Even now the Islamic Republic has still not accepted any responsibility regarding Siamak Toubai and the disappeared like him. There are many names. Javad Taghavi, Mohammad Salami, Behnam Majd Abadai, Hassan Eftekharjoo and more. But the diplomacy behind arresting them and then making them disappear for good and not acknowledging it continues after the black decade of the ‘80s. Between 1993 and 1994, twelve Jewish Iranians attempted to leave Iran. They never reached the other side of the border and their fate is still unknown. These people attempted to leave Iran illegally because of the difficulties that exist for Iranian Jews. Their attempt was unorganized because of their lack of coordination with each other. Nourollah Rabizadeh, Farhad Ezati Mahmoudi, Homayoun Balazadeh, Babak Shaolian Tehrani, Ebrahim Ghahramani, Cirus Ghahramani, Omid Soluki, Eshagh Hacid, Ebrahim Kohan Soluki, Shahin Nik Khoo, Kamran Salari, and Rubin Kohan Omid, are the names of these twelve from whom there is no news at hand. The fate of these twelve people is uncertain and according to Khalili, even the people who gave news of these twelve cannot be found after reporting it! However, the stories of disappearances continues. From the beginning, the names of the martyrs and the disappeared have been on tongues. Ezzat Ebrahim-Nezhad, who disappeared after the student protests at the University of Tehran in July 1999, was in fact killed, and named the martyr of University of Tehran Street. There are others from whom there was never anything heard. Saeed Zinali was a student who was arrested five days after the attack on the University of Tehran Street. So far no official news has been heard of him. This disappeared student was in touch with his family once very briefly, and since then there is no official news of him. There is, however, other unofficial news about him. Also, Amir Farshad Ebrahimi, from the plain clothes forces of Ansar-e-Hezbollah, discussed the torture and death of Saeed Zinali on his webpage. He wrote in a note that was published on December 2014, “Saeed Zinali, in process of interrogation and obtaining confession went through severe physical and mental torture and, as a result, on December 1999 went into a coma and was taken to Tehran’s Ghamar Bani Hashem Hospital belonging to Security Organization, and at the same hospital he, unfortunately, passed away.” Ebrahimi, also said that the security authorities of the reformist government were very well aware of this situation but chose to remain silent and still after all these years doesn’t say a word. And still, Saeed Zinali’s family is looking for a trace or a sign of their child. Even Saeed Zinali’s father was arrested for investigating the plight of his son and was asked to no longer follow his son’s case. But the story of a woman student activist and her disappearance during the events at University of Tehran Street in the year 1999 could be more strange and difficult than the story of Saeed Zinali. Fereshteh Alizadeh, a student from Sabzevar and an activist at the all-female Al-Zahra University, was arrested or kidnapped after the street protests at the University of Tehran and there is no trace of her to be found. The mother of this student activist could stand her daughter’s disappearance for six months only, and passed away as result of a heart ailment. Fereshteh Alizaden’s brother does all he can to find his sister. But there is no sign of the student activist. But, a former member of the Ansar Hezbollah, Amir Farshad Ebrahimi, said that Fereshteh Alizadeh was arrested by the army of Islam and then was killed. This is only an opinion of former member of the Ansar Hezbollah. Other than these bits and pieces of information, until now there is no formal and specific news about this student activist of Alzahara University. But, to the list of the disappeared from the University of Tehran Street in the year 1999, one must add the name of Tara Hamifar. She is a student living at the University of Tehran who was kidnapped during these events. No news of her situation has been obtained. There is a long inventory of names of the kidnapped. Maybe with the growth of social media and communication structures that are outside of the control and observation of rulers, the possibility of these kinds of disappearances and the lack of news will be less. As with the events of the Green Movement and the protest events following the 2009 elections, social media sites that came to the aid of the activists and protestors and there was no information, image, or film that could not be published. But these kidnappings and disappearances for Iranians, at the beginning and after victory of the 1979 Revolution, is not specific to inside Iran and still isn’t. Outside the country, also, there have been cases which if necessary they should be told as well. Of course these cases are separate from the murders and crimes committed by the security forces of the Islamic Republic of Iran outside Iran, and contain many butcherings and heinous killings of the political opposition in public places or in their homes. Sayyid Musa al-Sadr was an Iranian clergy member and was the leader of Shia Muslims in Lebanon. After some time, he was selected as the spiritual leader for all the clans in Lebanon. He and two fellow Lebanese were suspiciously kidnapped after a trip around Arabic countries. The Libyan Government never accepted responsibility for his kidnapping. Throughout the years, news of him being alive is published by those who are freed from Libyan prisons, but there is no definite news of him. Even after the fall of Muammar Gaddafi, Libya’s dictator, there is no specific news of this kidnapped Iranian in Libya. Other episodes of kidnapping also exist. In 1982 four Iranians were kidnapped by Phalangists of Lebanon, headed by Samir JaaJaa. Ahmad Motevaselian, military attache for Iran’s Embassy in Beirut, embassy employee Taghi Rastegar Moghadam, Seyed Hossain Mousavi, charge d’affaires in Iranian embassy in Lebanon, and Kazim Akhavan, reporter and photographer at Irna News, were the names of the four kidnapped. Their fate is still not known. Samir JaaJaa later gave news that they had been killed, but the news was never confirmed by the authorities. Throughout the years, despite Islamic Republic’s good relationship with the Lebanese government, despite the presence of Hezbollah as a force approved by and dependent on Islamic Republic of Iran, there is still no confirmed news published about what happened to these people. He told the truth. 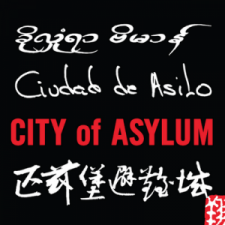 Still the names of many disappeared have also been disappeared, and the government does not allow a seam of information to be opened. It prevents the publishing of this information seriously and continuously. Maybe time has to pass and a fundamental change has to occur before the heart of security houses are opened and the guardianship of documents is opened and it could be known how many people have been disappeared in these ways in Iran. Maybe time has to pass to know why the Islamic Republic never took seriously the fate of the Iranians who were kidnapped by others and even those who were intimates of the government. Maybe time has to pass before documents are revealed. Maybe what happened should stay in our memories until it is clear that the authoritarian regimes, more than the life of their citizens, are after saving their own existence inside and outside the country. Maybe until then there can be nothing more to this matter than there is to some foam on water. Read this piece in Farsi. One Comment on "The Disappeared Throughout the Decades: A Secret in the Heart of Security Houses of the Iranian Regime"